Motorcycle Closeouts is the King of Closeouts for the motorcycle apparel market, but in recent years saw heavy encroachment from larger competitors. 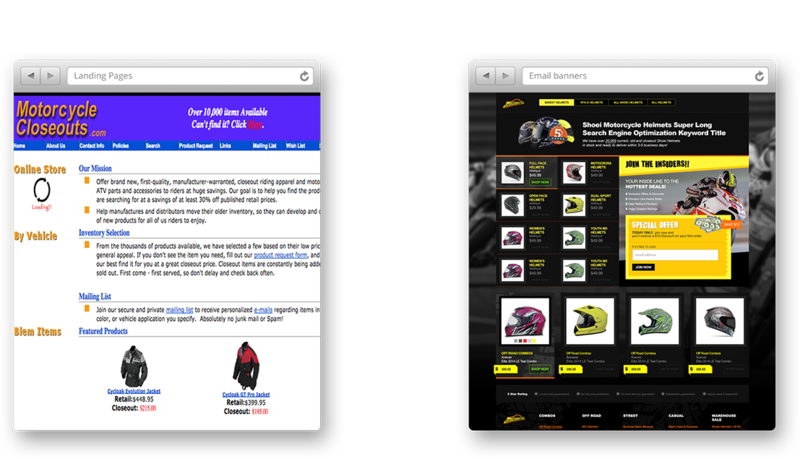 They needed tactics and marketing that would help restore their conversion rate and position their company for growth. 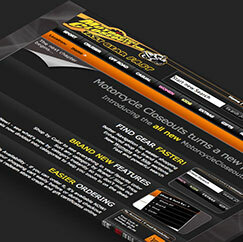 We've worked with Motorcycle Closeouts for nearly a decade, in various capacities. 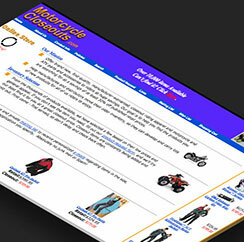 In 2004, we were introduced to Motorcycle Closeouts. 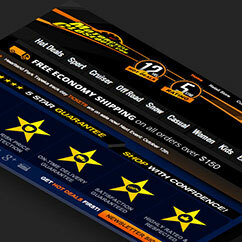 Our first objective was to improve their website, which at that point in time was was pretty ugly. 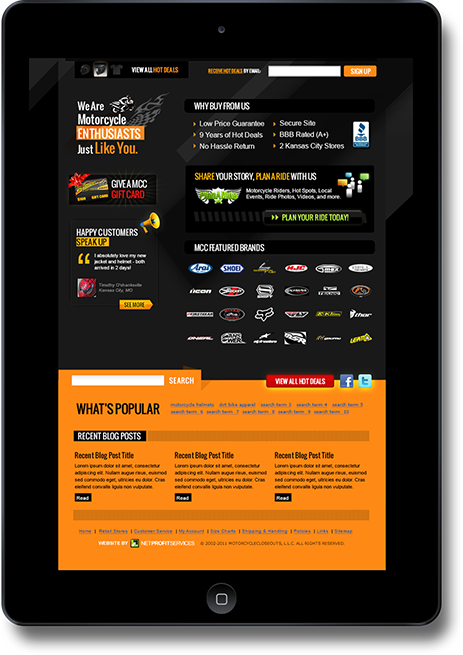 We completely reskinned their website, and then went away for a few years. By 2007 their retail store had outgrown their system. 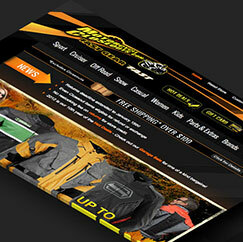 Needing more robust features, they tasked us with building a new retail and e-commerce solution from the ground up. We launched their new platform in late 2007. 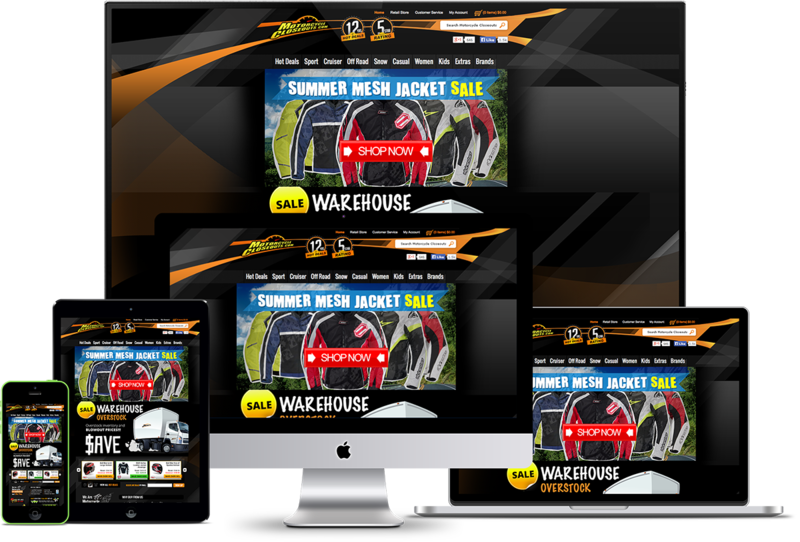 For the next three years, through 2010, they experienced explosive growth in online sales. 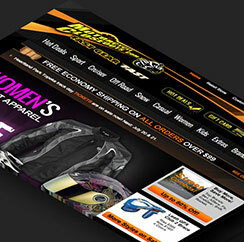 Starting in 2011, Motorcycle Closeouts saw large competitors enter their niche space. 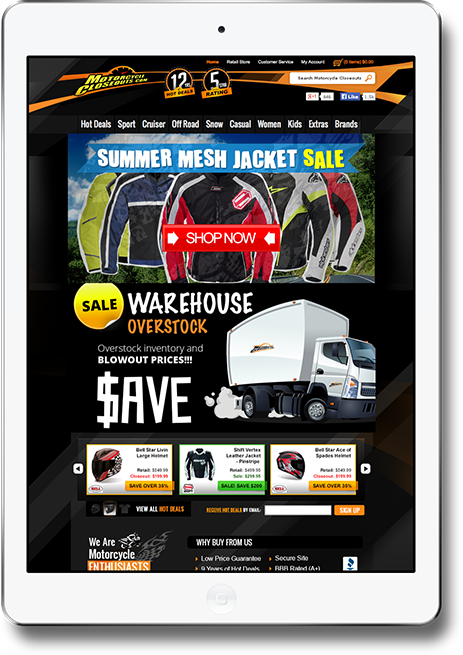 Big companies like Revzilla, Motorcycle Superstore, and even Fox, selling direct, were suddenly major competitors in the motorcycle apparel closeout space. 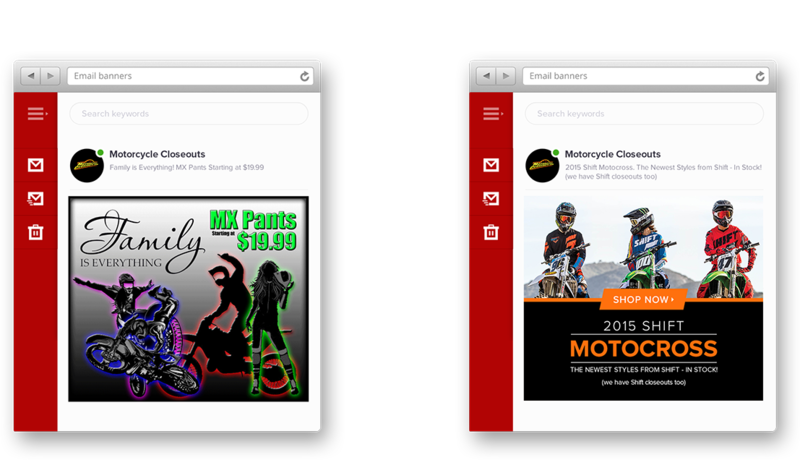 We helped Motorcycle Closeouts by building two unique tools to aid their marketing: Insanity deals, which are time or quantity-limited sales to drive urgency; and package deals that help customers find and buy matching sets of gear, often doubling average order totals. These two tools were instrumental in raising conversion rates and increasing ROI. The second, and larger, part of their comeback story came during Q4 of 2012 and 2013. 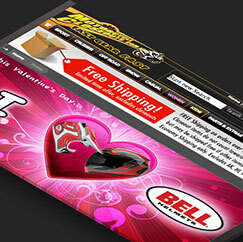 In both seasons we helped to strategize, design, and execute marketing campaigns that produced huge results. 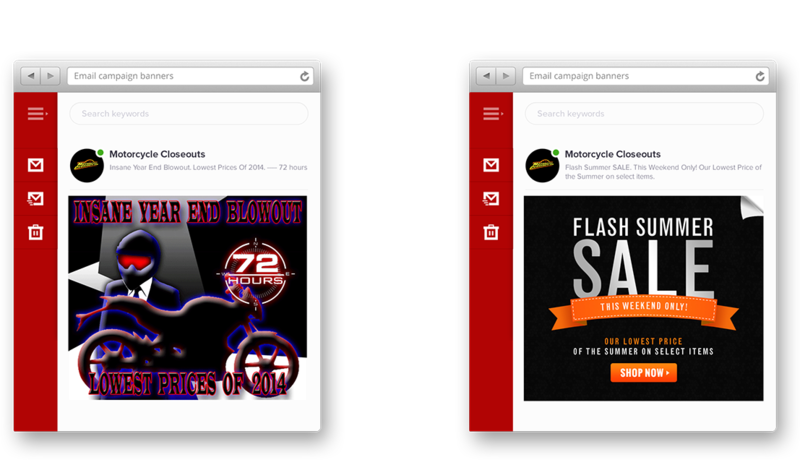 The final chapter of our Motorcycle Closeout story came in the optimization of their paid advertising, and transitioning all marketing tasks to their internal marketing team. The marketing ROI and results from the above story cannon be published online. Ask us for details. 1PHASE ONE Develop back end tools. 2PHASE TWO Plan & Design compelling marketing offers. 3PHASE THREE Optimize outbound marketing and transition to their internal marketing team. 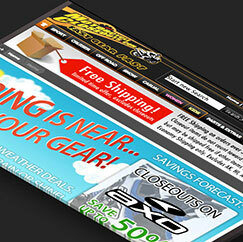 This is what Motorcycle Closeouts looked like before we got involved. Our first project was to re-skin their current site. 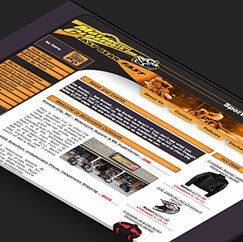 We launched a custom website in 2007. Marketing Campaigns made 2013 the best year ever! 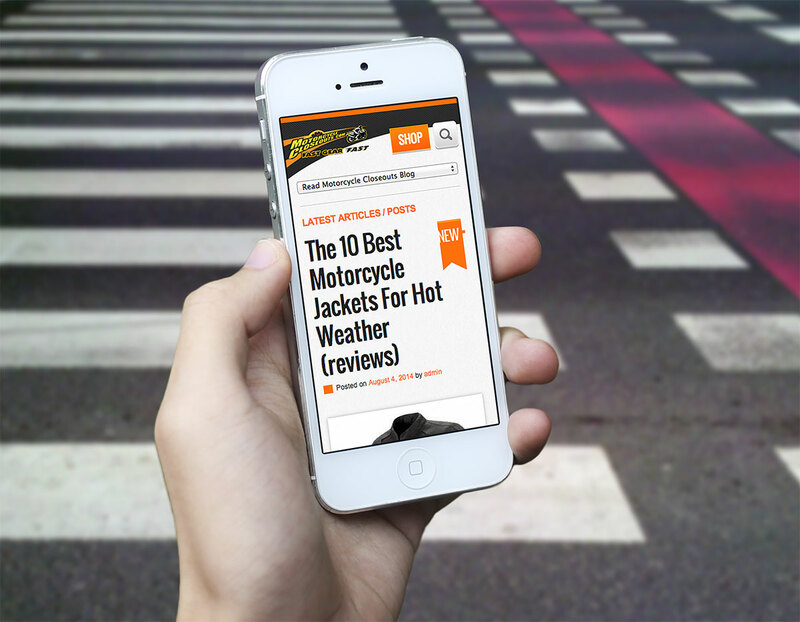 Optimized outbound marketing for 70% improved ROI! Transitioned marketing to their internal team.